One of the many perks of living in Las Vegas is its close proximity to some of the world’s most beautiful natural attractions. 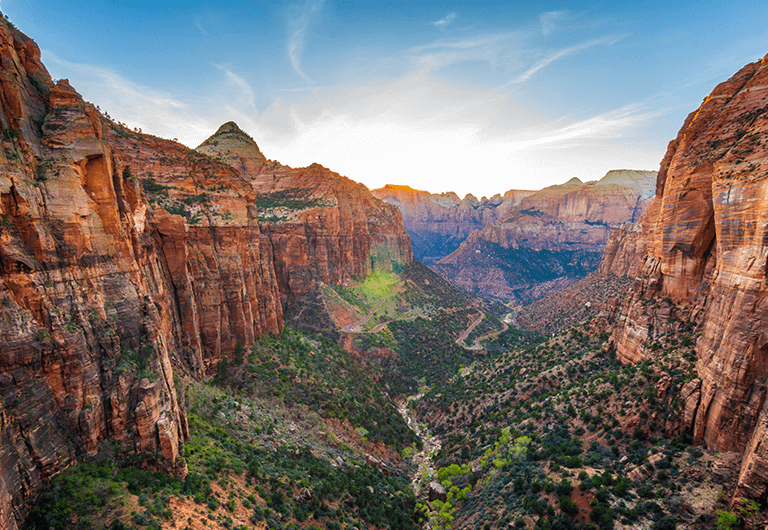 Zion National Park is globally-known for its idyllic scenes and incredible opportunities for adventure. Vivid colors and intricate rock formations greet each visitor. An escape to Zion is every outdoor lover’s dream! The journey from Vegas to Zion isn’t long. In fact, it usually takes less than three hours. But, the path is packed with attractions that are well worth a short detour. 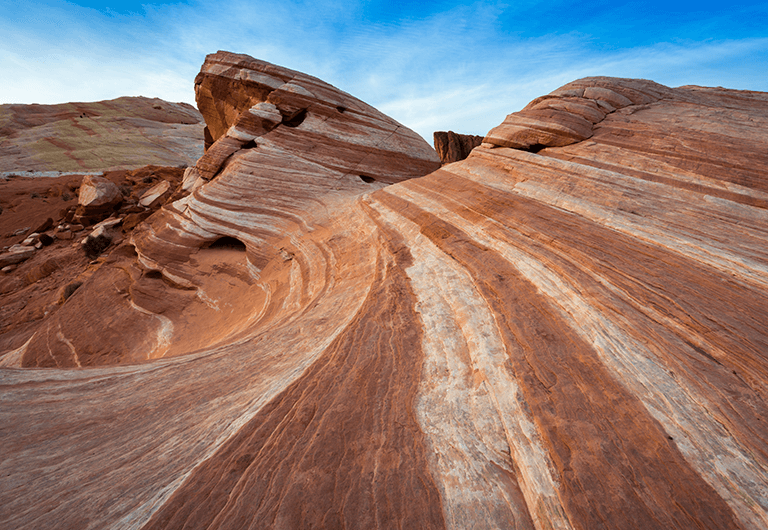 A couple fun stops along the way include Valley of Fire State Park, Quail Creek State Park, Sand Hollow State Park, and Grafton Ghost Town. 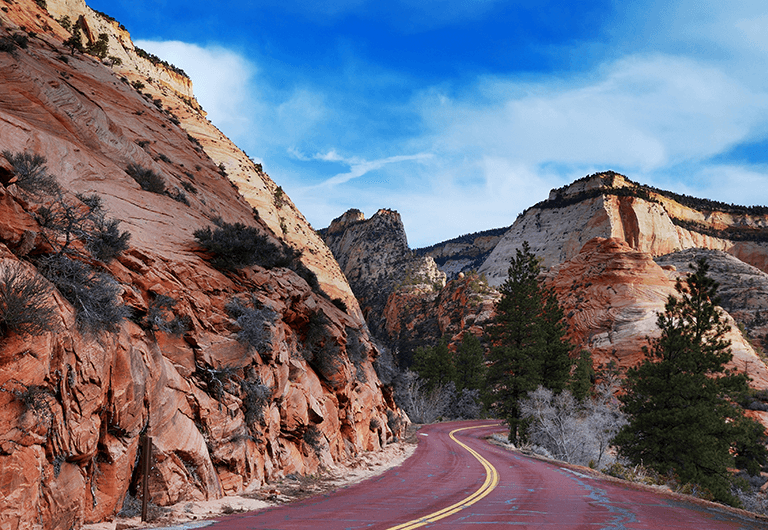 The state parks that line the drive offer a glimpse into Zion’s natural beauty. Quail Creek offers sprawling views of a serene lake backed by desert landscape, while Sand Hollow boasts red rock beaches and idyllic camping opportunities. Valley of Fire State Park couldn’t be more appropriately named. Fiery-hued rock formations decorate the landscape, creating a vivid playground to explore. Grafton Ghost Town features both original and restored buildings, a cemetery, and expansive views of the desert. The town’s rustic aesthetic has earned its exposure in films like Butch Cassidy and the Sundance Kid. Lastly, the view driving back to the route on Smithsonian Butte Byway is an added bonus. 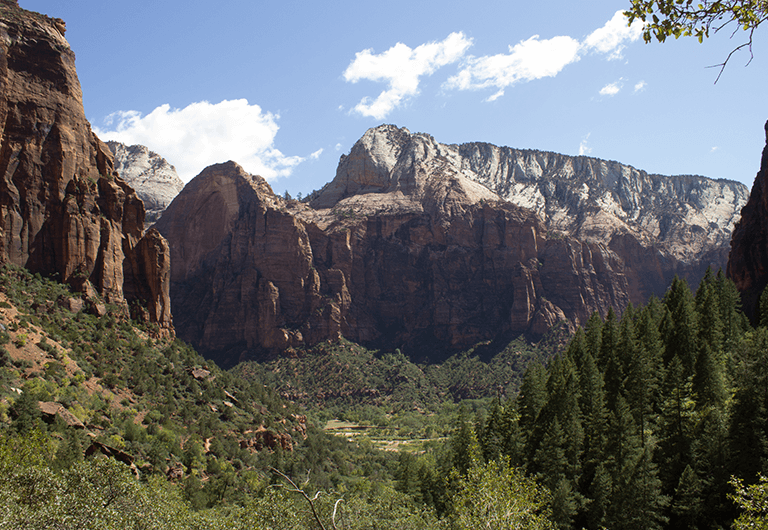 If it’s your first time visiting Zion Canyon, talk to a park ranger when you arrive. Get any last-minute questions answered, learn about the park rules and guidelines, and find out about great spots that you should check out. Rangers have updated information and are your guide to Zion. From April until November, ranger-guided shuttle tours are available at no cost. The tour takes two hours and can help you and your group decide which areas of the park you’d like to explore further throughout your trip. If you’re interested in the tour, make sure to book in advance as seats fill up fast. Zion National Park is home to hundreds of species of birds and mammals. Go on a quiet nature walk to see how many different animals you can observe along the way as you get acquainted with the park. As an alternative to the two-hour ranger-led tour, you can ride the open-air tram, which gives you a narrated birds-eye view of the park. This tour is a bit shorter, taking a little over an hour. The tram glides over the gorgeous Zion Canyon Scenic Drive, taking riders along the Virgin River and between the towering canyon walls. One must-do during an escape to Zion is hiking to the Emerald Pools. Three hiking trails, ranging from easy to moderate, lead to these gorgeous pools. If you want to see all three pools, we recommend that you take the path to the Upper Pool. This path is still relatively short, at 2.5 miles round trip. Many visitors to Zion deem the Emerald Pools the highlight of their trip. The deep blue-green of the water creates a lovely contrast with the vivid oranges and reds of the landscape. Combine scenery with adventure by taking a bike ride through the park. Although bikes aren’t allowed on park trails, they are permitted on Pa’rus Trail and Zion Canyon Scenic Drive, both yielding unbelievable scenery. If you don’t want to take your own bike with you, there are bike rental options within Zion National Park. Satisfy your inner adventurer by exploring the Narrows, the slimmest section of Zion Canyon. From above, the Narrows look like a simple sliver of water, but from the ground, visitors enjoy an exhilarating view. The path is sometimes just 20 feet wide, while the canyon walls stretch thousands of feet above. Wade through the rivers of the Virgin River as you make your way through. No guide to Zion would be complete without Angel’s Landing. The view from the top of Angel’s Landing is perhaps Zion’s most iconic scene. The hike to the top takes about four hours and has steep rocks and narrow ridges, making the journey to the top just as exhilarating as the view itself. Make sure to take plenty of water with you and follow the rangers’ advice. Zion National Park and the surrounding areas make for the perfect natural escape for Vegas residents. Expect vivid colors, panoramic views, exciting plants and wildlife, and endless opportunities for adventure. It’s the close proximity to memorable experiences like these that make living in Las Vegas so exciting!